Hey y’all! Welcome back. If you are new to STP, one of our ongoing projects is the creation of a home management binder. We have been steadily adding templates week by week and hope to have the finished product out to you soon. Below is the list of the templates already created to date. Feel free to print and use these templates as-is or you can use the templates as a guide to create your own. Today we will add a new template to our folder called the Health and Emergency Contact List. The previous contact list template that was created is for keeping up with personal contact information of friends, family, and acquaintances. 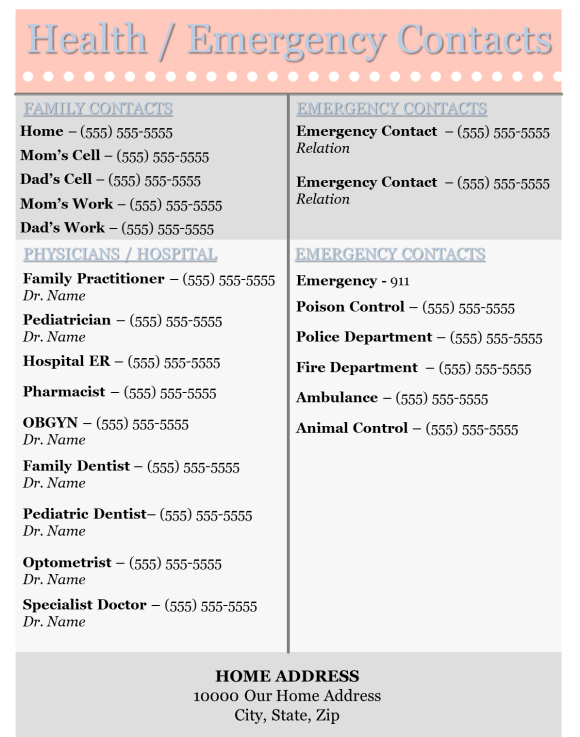 The Health and Emergency Contact List template is a one-page go-to sheet where you, your spouse, a family member, or baby sitter can easily track important numbers should a health related issue or emergency arise. The top part of the template on the left-hand side contains important family contact numbers. This will include the home phone number (if you still have one), mom’s cell phone, dad’s cell phone, mom’s work, dad’s work, and any siblings who are old enough to have a cell phone number. The top part of the template on the right-hand side includes two (or more) emergency contacts if mom and dad (or whoever is on the top left-hand side) can’t be reached. This could be a family member, neighbor, or anyone else that would be a good contact in the case of an emergency. The second section on the left-hand side is for health related contacts. This includes all doctors, dentists, hospitals, etc. For some families, this might just be a single doctor, dentist, etc., but for other’s you will also want to include all health related specialists, allergists, dermatologists, etc. The key is to have all of the important health contacts in one place. That way it is easy to schedule or update appointments as well as contact the office for an emergency, should that be necessary. The second section on the right-hand side are the common emergency numbers starting with 911. Although 911 might seem unnecessary for you to remember, if one of your children are looking for an emergency contact number, this might not be the first number that they think of. Other important emergency contacts might include: poison control, police department, fire department, ambulance, and animal control. At the bottom of the health and emergency contact form, it is helpful to include your home address. This isn’t necessary for you, but it might come in handy for small children or a baby sitter who don’t know the home address off-hand. As with all of our templates, we hope that this will help make your day and home management a little bit easier. As your family grows and changes, so do your organizational needs. Check back soon as we add more templates to our home management binder.